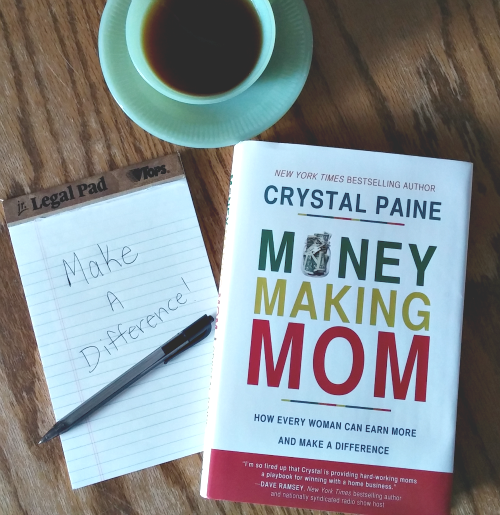 I was recently given the chance to read the book Money-Making Mom by Crystal Paine who runs the blog Money Saving Mom. Amazingly enough, I didn’t walk away from this book thinking that I needed to make more money! At least, not in this season of my life. One of the things that Crystal stresses in the book is that more money isn’t going to satisfy. There needs to be a reason you want to make more money other than to make more money. Back in July, I came across several blogs that had just started and were already making hundreds of dollars each month. I compared my blog to theirs, and thought that mine didn’t measure up. So I started using every spare minute I had to work on my blog. I became stressed and tired and grumpy! After about 2 weeks of this, my husband finally talked to me about it. He told me that my most important job was being a mom. The only one putting pressure on myself to make money from my blog was me! Yes! That is what I want too. Sometimes I wonder why anyone would want to read what I have to say, but Crystal reminded me that there is only ONE me. I have a unique perspective and story to tell. God wants to use me to make a difference and impact others for good. So for now, I am setting goals and working on taking one step at a time to improve my blog. Will I ever make money from it? I hope to. One day. Crystal’s words have lit a fire in me to work towards that goal no matter how long it may take. But during this season of my life I am not a “money making mom”. Instead I contribute financially to my family by saving money. In the past year I have learned how to cut our grocery budget down, and I’ve gotten creative at saving money on my son’s clothes. Before I read Crystal’s book, I was sure that I was going to walk away with a list of ideas to start making money, but that was not my take away. While Crystal’s book is full of practical ideas and advice about making extra money, I was challenged to take an honest look at my life and blog right now, and take small steps to make them better each day. Crystal’s book is now available at book stores and on Amazon. I hope that you will either check it out from the library or purchase a copy if you are able. It will challenge you to use the talents and skills that God has given you for a higher purpose than yourself. I strongly encourage you to check it out! What a wonderful outlook. I love what you said about your job being to save money now. I needed to hear another mom's experience that is similar to my own. Thank you for providing that! It is always an encouragement to hear how someone else's experience is similar to our own. I think that is why I love blogging so much. We can encourage each other that we are not alone! This is so true Emily. I also save my family more money than I make with blogging. I love that your first priority is your family. Being frugal at the grocery store and watching what you spend saves a lot of money. I love your take on this book! Have a great day! Vickie, I love reading the creative ways you come up with to save money! I feel like God has blessed us and provided for our needs because we choose to make our family a priority. Hope you have a great day as well! Well said, Emily! I agree completely that we all different responsibilities in different seasons – and right now, we need to focus on being moms to our long-awaited little guys. Oh, and congrats on having Crystal share your post on her blog today. That's exciting! Thank you, Kristen! I am humbled and excited that Crystal shared my thoughts on her book. This season of being a mom is so rewarding, and I want to make the most of it! It has been fun chronicling my thoughts and experiences from motherhood here on the blog! Well said. I loved the book. I love you're take away. We have different seasons and comparison to others whose season is different is defeatist. I really appreciated that reminder. I'm glad Crystal shared your post so I found your blog. Have a blessed day. Thank you, Joyce. I loved the book too. It is about so much more than just making money. I appreciate the encouragement that Crystal shared throughout the book to only compare ourselves to ourselves. I haven't read the book for the exact reason that right now, making money is not in the game plan – I'm still trying to "Say Goodbye to Survival Mode!" Love this, Love your honesty. I'm glad you can relate! I haven't checked out her other book, but after reading MMM I think I would enjoy it! I appreciate how practical and relate able Crystal is. You are so kind, Keelie! I have wanted to give up so many times, but I know that God can use me so I keep at it. I am in a similar place as you, my husband also told me to slow down and refocus. It is hard not to be caught up in the idea of building our blogs quickly. Thanks for your words! Husbands can be so wise! What would we do without them? 🙂 I have learned that I can't do it all when it comes to blogging, so I do the best with what I can do. Great post, and the book sounds great too. I'm not in a money-making season of life either, and that's OK. That's not my calling right now, and guess what, I can live with that. I was thinking about that and just wrote a blog post about what my calling actually is right now. Yes, we all have different callings, and those callings can change throughout life. I'll check out your post! I really appreciate this review. I feel the same way. I just started my blog a couple months ago and while I would like to make money from it (someday) I don't have the time and energy to completely focus on that goal right now. I have gotten a little sick of the 'you can and should be making money' outlook that I feel is often touted all over the web. I'm perfectly happy being just a mother. I pray daily that God show me if He just wants me to drop the whole blog thing. I only want to do His will. I'm glad to know Crystal covers this in her book. I agree, Elizabeth. Lately, over the past few months I have been praying that the Lord would show me what He wants me to do with this blog. There have been discouraging times when I have felt like stopping, but I believe that the Lord wants to use me through my blog. Right now, that doesn't involve making money. I hope that you find clear direction from the Lord as to what He would have you do. Being a mother is a pretty big job itself! I love this honest and heartfelt review. It's so difficult to resist comparing ourselves with other's successes. I really appreciate your outlook! It IS so hard not to compare ourselves to others! I appreciated Crystal encouragement to only compare ourselves to ourselves. It was an encouragement to me. Great review, and thanks for sharing your own personal insights!